It’s cold here in Nebraska. So cold, finally! Though I prefer to be outside (even during the cold weather months!) the house is feeling more and more like a cozy refuge to me. Tomorrow’s high temperature is supposed to only be 7 degrees! Oiy! Now that’s cold. My chickens, like me, prefer to be outside at all times, even when it’s cold. If there’s not rain or snow or oobleck or anything else coming down from above, or if they (the hens) aren’t busy laying their daily eggs, they prefer to be outside. But. There are hours of confinement that they spend inside, just because it’s too icky to be outdoors, even for a chicken. Or me. In defense of the predators that roam around our place at night, we shut the flock into the coop at sundown. They actually take refuge in there on their own accord. So it’s a simple matter of tripping out to the coop and closing the back door and securing it, and pushing The Big Rock up against the front door, and they are snug and safe for the night. Of course there was that summer when, no matter what we did, predators snatched our hens, one after another, even tearing the screens off the windows to get into the coop, but (sigh) that’s another story, never mind, . . . . So, by the time the chooks are shut in at sundown this time of year (usually by 6:00 p.m.) , and if I let them out again in the morning by 8:00 a.m., they’ve been cooped up in their little house for (gak) fourteen hours! That is a lot of time for my flock to sit and twiddle their theoretical thumbs. 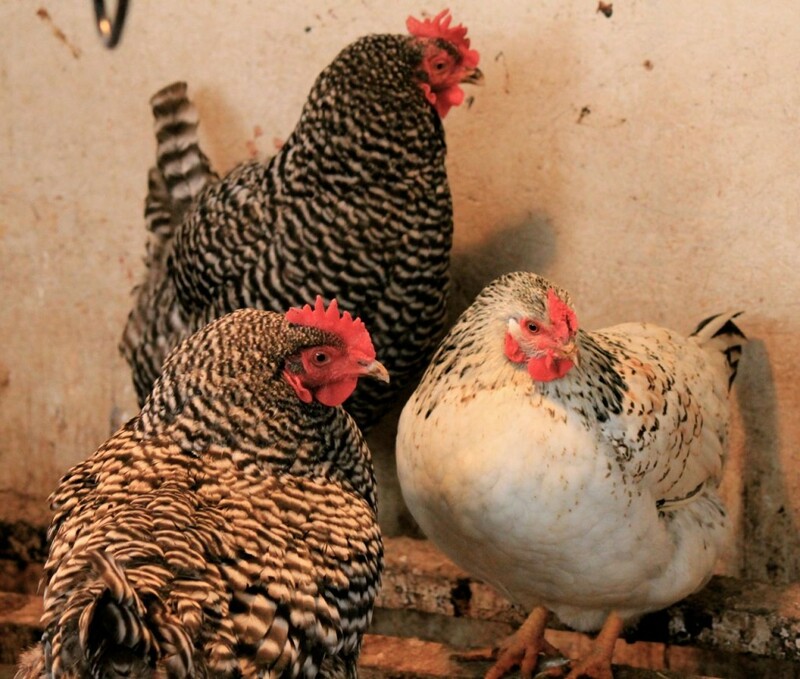 Winter doesn’t have to be a miserable time for your flock. There are a few things that I keep in the coop to make this long confinement more tolerable and healthier for my chooks. I actually enjoy fussing around and making sure that my chooks are comfortable on days like this one. There’s not so much to do outside, and it’s a welcome break from my house. Whatever. 1. Leaves are a great addition to the deep litter in your coop. You know that I’m a devotee of deep litter in the coop, and for that matter, in the yard, as well. I toss a bale of hay or straw into the coop every now and then, but the leaves that I gather and toss in really make it a nice, cozy place for the chickens. They scratch and dig and find stuff in there to eat (I’m still not sure what that is) and make the bedding a lovely garden amendment by spring. My folks bring out bags of leaves for me (I think oak leaves are the best) (and yes, I know that I’m spoiled blessed) and I ration them out through the winter. Yikes, I think I only have one bag left, Mom . . . I move the regular feeder inside too, during severe winter weather. 2. Food-grade diatomaceous earth kills mites, lice, fleas, ticks and other parasites, which can be a big problem during the winter time. During the summer, the chickens take dust baths, and the little critters aren’t such a problem then. The sharp microscopic silicon particles in diatomaceous earth filters through the hard-shelled bodies of fleas, mites, ticks and other parasites, resulting in dehydration and ultimately, death. Bad news for the bad bugs, good news for your chooks. I buy this 10-pound size (it’s cheaper!) and sprinkle it into the nesting boxes every week or two. 3. Oyster shell is important to keep in your coop, if you have laying hens. I keep it in a big rubber bucket, where hens help themselves to it as they need it. And during the winter, especially, they need it. The eggshell for each egg that a hen lays is about 95% calcium carbonate. In just one year’s time, the amount of calcium that a hen will put into her eggshells can equal 20 times the amount of calcium that is contained in her bones. In order to stay healthy and produce strong egg shells, she needs to consume a steady supply of calcium. I also crush egg shells from the eggs that we eat and feed it back to my hens. If you notice that your hens are laying eggs with thin or fragile eggshells, they probably need more calcium in their diets. I buy a big bag of crushed oyster shell and provide it free choice in my coop all year round. My chickens don’t eat a lot of it, and it lasts a long time. Roosters don’t really need oyster shell in their diets, but Fezzick here looks like he’s thinking about taking a bite of it. 4. 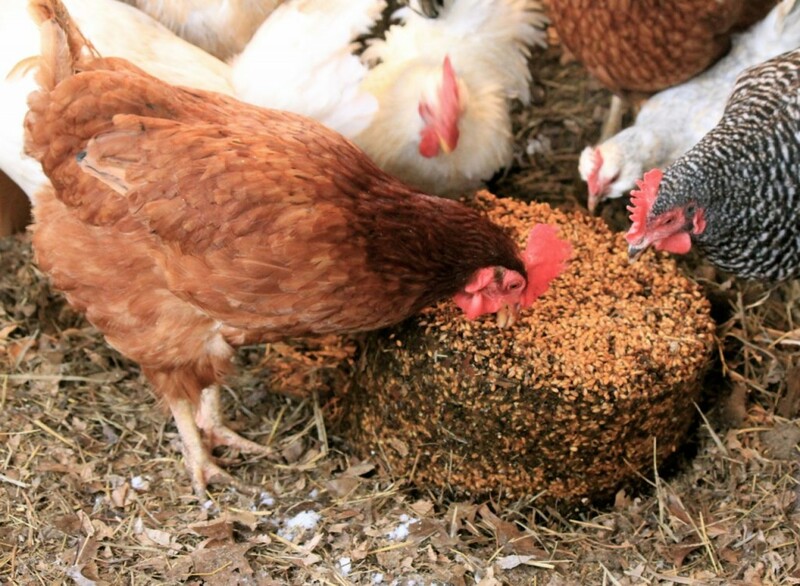 Sand and/or dirt added to your coop will make your chooks very, very happy. It’s funny, isn’t it: we put down a cement floor in our coop to foil the predators, but now I wish it was a dirt floor, because I know how much my chickens would enjoy digging and scratching in the dirt. And this is the way Harvey Ussery does it, so I know that it’s the way I should be doing it *sigh*. 5. Fresh water is so important in the dark cold days of winter. I’m a bit of a fresh water freak, for my family and for my chooks. I inherited this from my dear mother. (Got a headache? Drink water. Tired? Drink water. Depressed? Drink another glass of water!!) I used to carry out buckets of water to our flock, but then we ran water trenches to the chicken coop so I had hydrants out there, and my life got much better. THEN we ran (actually my dad and my Uncle Harry and yes, I know I’m spoiled rotten a lucky duck) ran electricity out to the coop and life got better still. Then I bought one of these heated buckets just for the chooks (my dogs have one, after all) and my life got About As Good As It Could Get. Yeah, they’re a little pricey and YEAH they are worth it. Don’t have one? Order one TODAY. It’s winter. Be good to yourself, and to your chooks. Every time I look at this heated bucket, I remember the person (fondly) who gave me a not-so-gentle kick in the backside when she found out that I was carrying water buckets from the house because the water would freeze every day. And every night. And ever anon. 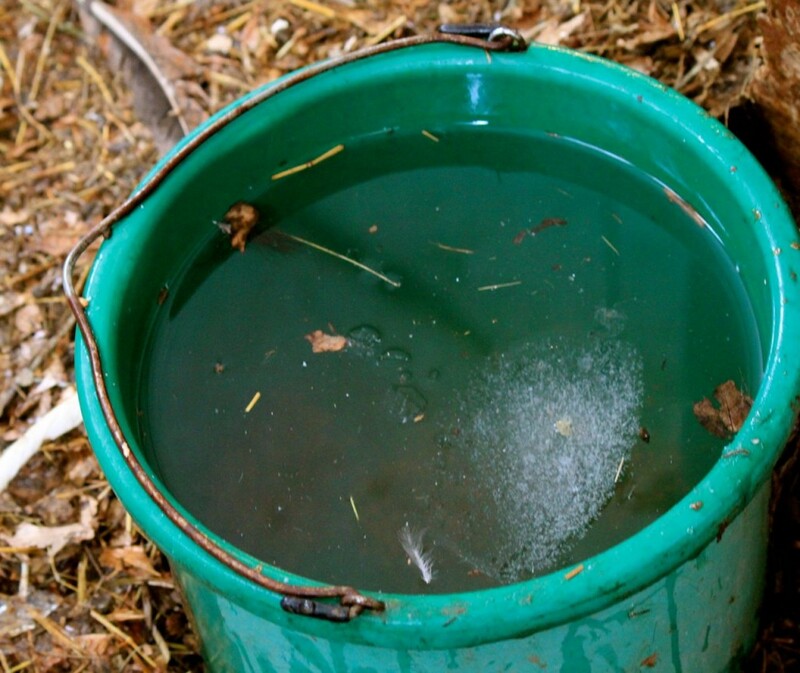 Heavy frozen blocks of ice in buckets. “Buy a heated bucket. Today,” said she, fixing me with a steely stare of incredulity. So, if you’re doing this, Gentle Reader, to save a few bucks, consider this the kick in the backside you might need. Trust me. You’ll thank me. 6. I toss a handful of grain into the coop when I trek out every evening to shut the chickens in for the night. I know that the hens wake up early and begin to lay their eggs, and probably badly need some energy. Because of the deep litter, there’s always something to eat in there, but I like to topdress it with a handful or two of fresh grain, too. Plus, that way I don’t feel so bad if I don’t get out to the coop as early some mornings as I’d like (cough). 7. I make soaked grain blocks and leave one in the coop when it’s really cold. I fill a 5-gallon bucket about a third full with grain and water, and then leave it outside overnight to freeze. In the morning, I upend the bucket in the coop, and give it a stomp or two with my foot until the block releases itself from the bucket. The chickens love these blocks and I’m sure they help not only with feeding them, but also with fending off boredom in the coop (no Netflix out there). That’s it! 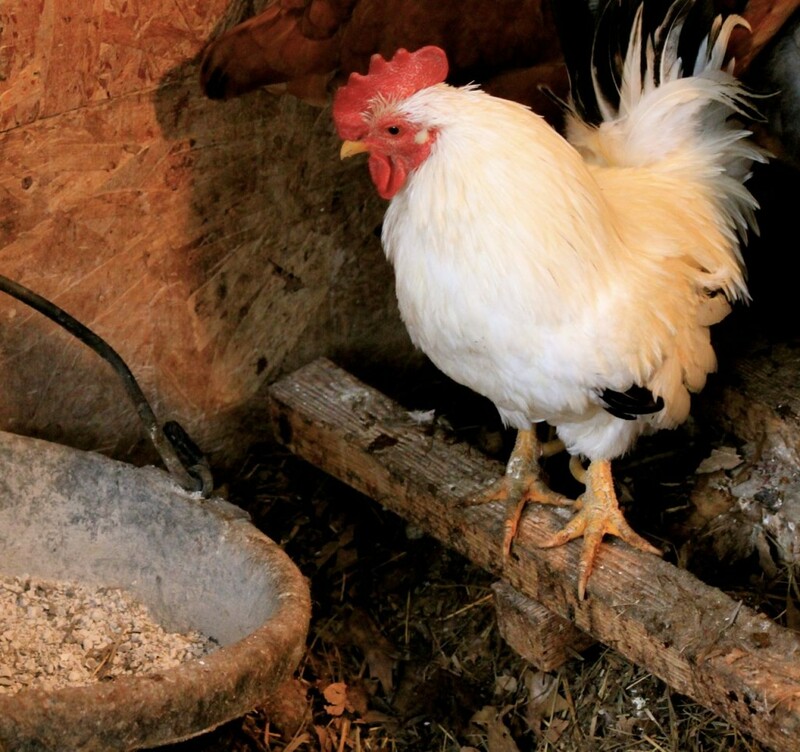 The 7 very important things that I keep in my chicken coop during the winter time. The weather will warm up again, thankfully, but until then–it’s hot tea and quilts and staying close to the woodstove for us human comfort-seekers, and fresh water, grain blocks, leaves, and a few other things for the flock. By the way, if there’s anything in this post that you think might be of help to somebody you know who keeps chickens, could you do me a big favor and share it with them? Use the handy sharing buttons below, or old-fashioned email or just write my web address on a napkin and slip it to them sometime. I’d love it if you’d do that for me. And thank you, in advance! Aaaand by the way . .. if you enjoyed this post and want more tips like this to keep your chickens healthy and happy, check out my new ebook! Over one hundred valuable and practical tips, learned over the span of a decade and a half loving on my chooks. And for a short time, get it for whatever price you wanna pay! Score! Tagged on: cold weather needs for backyard chickens, healthy measures to take for your chickens in the winter, how to care for your chickens in the winter, how to make your chickens comfortable during the winter, what do I need to do for my chickens during the wintertime? Great post! I found you on The Homestead Barn Hop and I’d like to invite you to share your talent on The HomeAcre Hop on Thursdays! This week we are having a special hop for your ‘Best of 2014’ posts…hope to see you there! Well, thank you very much! I’ll try to remember that, and I’d love to join in-sounds like fun! I’m tucking these ideas away for next winter when Jim and I take over caring for the flock. We purchase DE in 50 lb bags and use it for the goats. Kathy, do you get that at the farm store? I think it odd that the temperature tendencies have been so much the same at your place and mine, since we live on opposite sides of the the continent. It’s become really cold here too in the last couple of days. Last night’s low was 1.5F and today’s high will be 19F which is still pretty cold. I wish my coop were big enough to do this deep litter thing. We only have 4 girls. When the coop is this small, and the temps get this cold, you have to balance the number of chickens and the light bulb wattage and the venting carefully. I try to keep the coop just above freezing. The sun shining on it too makes the temperature soar and we don’t need to stimulate a molt during winter. It’s worth the trouble though. I love my girls and of course the fresh eggs. Duh. Nebraska, not Nevada. Not quite opposite sides. I’m glad you’re not in Nevada. I heard lately about all the radioactive stuff dumped there. Not good. What’s not to love, eh, Rita? I always find such interesting information about your life everytime I visit your blog 🙂 Thanks for sharing this information that others may find useful 😉 Great pictures! Thank you, Joan! I hope you have a happy new year, too! THanks Donna. Where in Nebraska did your Grandma live? I love this post. It brings back so many memories of when I had my chickens. And my goats, and geese, and pigs, etc. I could spend hours out there with the animals. Preferred them to people, actually. I miss the sounds the chickens make. Mine were all Golden Comets. Thanks for sharing. You make some very good points! Peace. Cluck-cluck. Hi Jeanne! Sounds like you had quite a menagerie! Amy, thanks for the great info. We are first year chicken parents, so are learning so much from your articles. I just passed on your idea for the grain block to my husband… may I ask what grain you use to make it? We are doing the deep litter method (I hope we are doing it right!) and our ladies are living in a converted old horse stable. They even have a nice covered “porch” area that stays pretty dry, and they’ve dug themselves a nice dirt bath area out there. We bought a big heavy block of stuff for them to peck at that we keep out on their porch, but I love the idea of making our own! Thanks for the info! I’ll look into getting some grains so we can try it out. It’s going to be really cold here this week, so first we have to figure out what we need to do to deal with minus 0 temps! Brrr! When it’s that cold, I leave a lightbulb burning day and night over where the chickens sleep at night. I don’t know if they need it or not, but it makes me feel better, for them! Thanks for all the good info. We only have 2 hens. Do you make the grain blocks out of normal feed? I just started in August because I wanted fresh eggs. They haven’t lauded eggs for 2 weeks. We were out of town and our neighbor took care of them. They stopped laying the day after we left. One more question. Once they go into molting do they not start laying till the weather warms up?? I really enjoyed your article. Good questions, Dana! You can make the grain blocks out of a variety of things, though I prefer using sprouted grains. Chooks certainly can go through stress and stop laying (like having somebody else care for them, or a wild change in weather), or they can go through a molt and they’ll stop laying then, too. 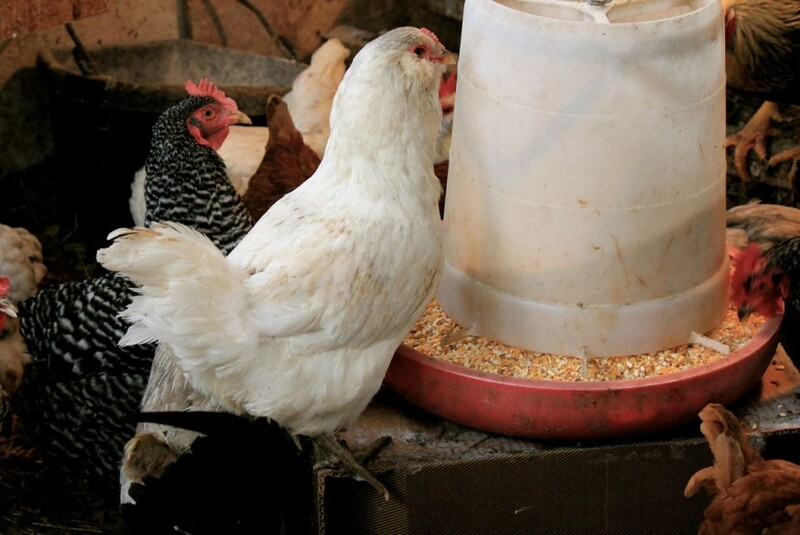 Chickens vary in how long they take to complete a molt, too–it can take several weeks or a couple of months. Don’t fret! If all their needs are met, they’ll likely start laying before you expect it. My experience this year–most of my hens went into molt in the fall, but now in early january they are all laying again. So it’s not necessarily the weather that determines when they come out of their molt, but how quickly they grow those feathers back. Hope this helps!